Young Geeks In Love… Or Not? So I haven’t seen the Young Geeks in Love (YGiL) for nearly a week. I was starting to get concerned. First I thought it was because I changed where I sat (My usual run is 8:20am on the ferry Mariposa) and they usually went downstairs so maybe i didn’t see them. 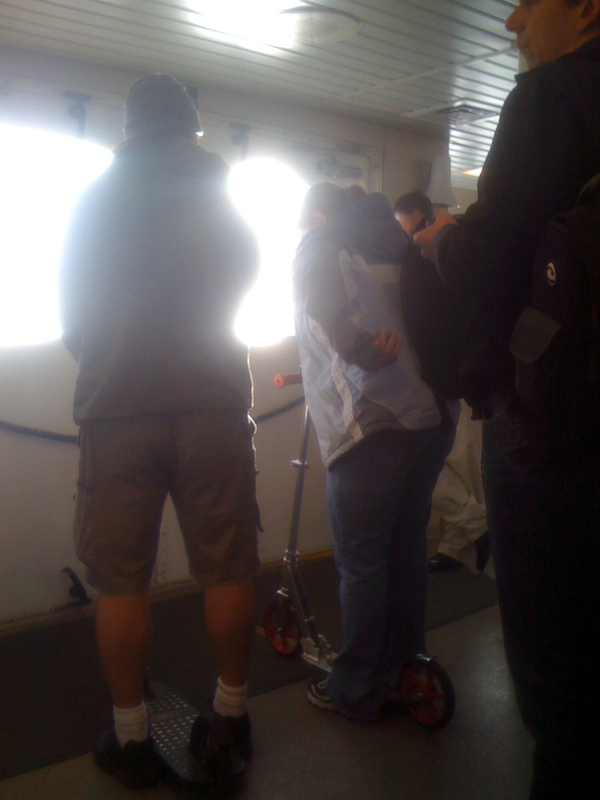 Then I started watching the people get off the ferry, like some freaky stalker, and didn’t see them either. I thought maybe there were on vacation or at a geek conference or something. Then Monday I saw her in the morning but not him. I wanted to run after her and ask about her counter part but i thought that might provoke too many questions and inquiries and she might find out I was blogging about them and what if they aren’t a couple or they broke up or they are international spies and I blew their cover? I am so confused. Yesterday I took the early 7:55am ferry Napa as I had left early in order to stop by Starbucks at the Point on get chai & a free morning bun because how can you turn down FREE? Today I am planning to be back on my same ferry so I will have to keep an eye on this situation. More as it develops.